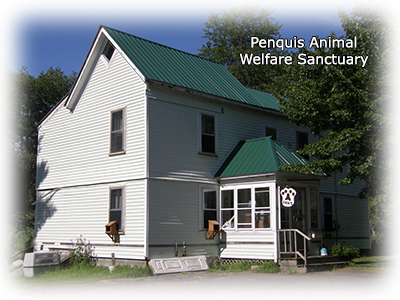 Penquis Animal Welfare Sanctuary (P.A.W.S.) in Milo is a community effort to maintain a no-kill shelter for the area's stray and abandoned animals. We have had an 80% adoption rate, and 100% of our adoptable animals will be adopted. We bring community awareness about programs such as the "Fix your feline by five months for $ 5 program" (for all of Piscataquis and Aroostook Counties). We are very busy and consider ourselves successful ! Private funding has been primarily through donations, fundraising events, and from donations generously left in our cans at Tradewinds. Three Rivers Redemption and Feed will pass through to P.A.W.S. any "bottle and can" money that you may wish to donate. Money donated at Tradewinds or Three Rivers Redemption are spent for food, litter and other supplies at the store where the donations originated because it is simply the right thing to do. Municipalities also provide monies for the shelter and/or for animals from the municipalities. P.A.W.S. is eternally grateful for the community's ongoing support for the shelter, its staff and its animal residents. We are often told that our pets have no problem adapting to their new homes, and are very loving and friendly. We believe two factors are important in helping our animals become loving family pets. The first is our home-like atmosphere. The shelter was formerly a family home, and we use no cages or kennels. Our residents are either housed in their own room or have free run of the house, depending on their health and/or temperament. The second factor is the hands-on approach to caring for them. Our animals are held regularly, cuddled and treated with love and respect. We have dedicated volunteers who spend time each week giving special care to the shelter and our guests. P.A.W.S., Inc. is an incorporated non-profit with a Board of Trustees, officers, and dedicated volunteers. To report an injured or sick-appearing animal call your town office or Animal Control Officer Joe Guyotte at 207.564.2187. Our Volunteer Coordinator is Sandy Smart of Brownville. Sandy oversees the training and scheduling of volunteers. Volunteers are always needed to help with the tasks of the shelter as well as to give our animals the human contact that maintains the animal's trust and acceptance for when they are matched with their own human families. Becoming a P.A.W.S. volunteer is a rewarding experience that starts with a phone call to Sandy. If you would like to join the P.A.W.S. volunteers in caring for the animals and the shelter, please, call Sandy at 207.965.8547. She will take it from there ! P.A.W.S. wants our supporters to know that whenever possible yard sale or rummage sale items that do not sell are also given a new home. Adult clothing and household items are cleaned (if needed) and donated to the Bangor Area Homeless Shelter. Children's clothing is generally directed to Ofelias for distribution to families, especially families re-establishing themselves after experiencing domestic violence. Other charities may also be re-gifted with our unsold goods as the need is recognized.